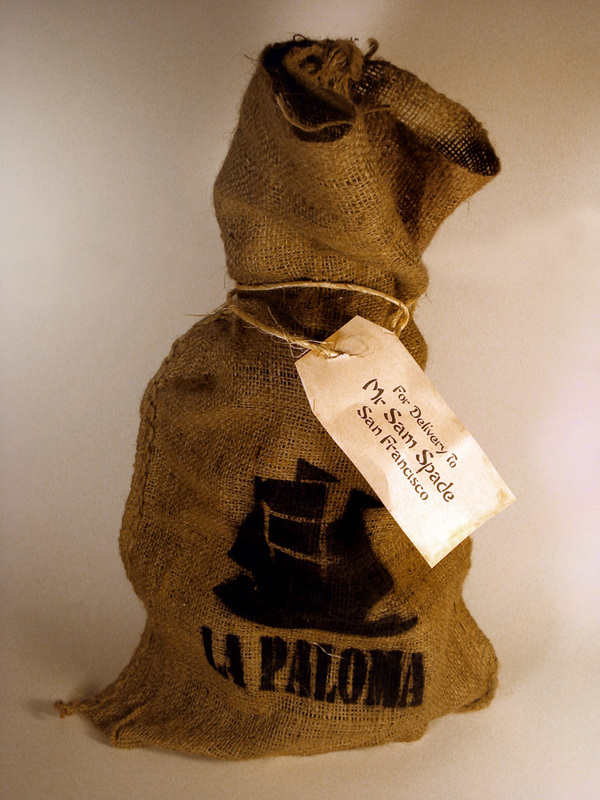 La Paloma Sea Bag Gift Packaging Kit - If you already have a Maltese Falcon, this is the kit for you. Contains Captain Jacobi's Burlap Sea Bag with the La Paloma ship and name stenciled on, an aged address label to Sam Spade, Chinese newsprint wrapping, shredded Chinese newspaper as packing material, and twine to tie the entire package together. Kit contains special packing and gift wrap materials only. Price does not include Maltese Falcon. The Haunted Studios™ introduced the idea of wrapping our Real Maltese Falcon™ in Chinese newspaper back in the 1990s, adding Captain Jacobi's burlap Sea Bag in 2005. Others have attempted to copy our Gift Packaging, but with little success. If you are looking for that something extra to make your Falcon stand out, this is it.